I learned many skills for sewing when I was a young child while sitting on the lap of my paternal grandmother at her Singer sewing machine. Even when I was too young to operate the machine, I watched and soaked in everything she did from moving the reverse lever in order to backstitch to winding bobbins. I should also mention that she was an avid gardener as well, from flowers to fruits and vegetables of all varieties. When visiting, we would all go out into her yard to see what was blooming or 'coming in' at the time. After my family moved to South Carolina from Mississippi in the late 70's, she always shared plants or cuttings from her garden. The the four 20" tree of life blocks which make up the background were pieced as one large block in order to eliminate as many seams as possible. The layout and some of the applique motifs are original designs. The iris and daylily blooms are from a pattern, Vintage Dreams, by Colette Belt. The dimensional applique technique used in the center hydrangea was from a book, Fabulous Flowers by Sharon K. Baker. 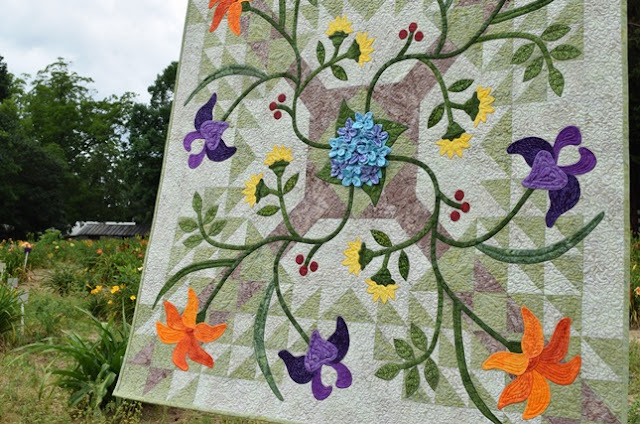 On a recent visit to Johnson Daylily Gardens I snapped this photo of my quilt where you can see more of the dimensional applique and quilting. paternal grandmother and transplanted to my garden in South Carolina. Now you can see from where my love of flowers comes and why I decided on Quilted Blooms for the blog name, right? Another favorite quilt is one I made in September 2013, Up the Wall. 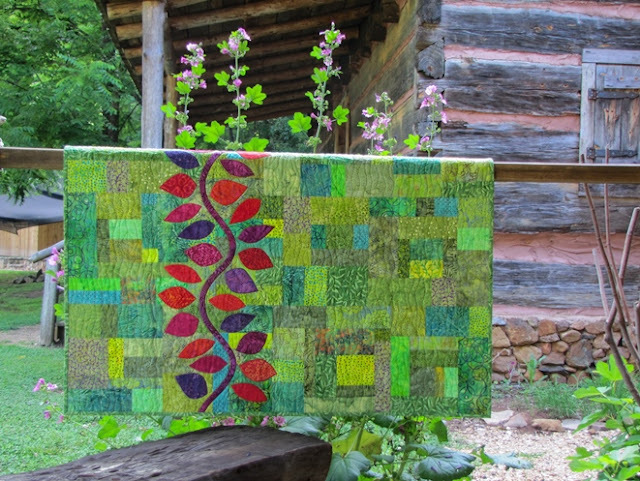 It is a variation of Leaves and Vine from Sunday Morning Quilts by Amanda Jean Nyburg and Cheryl Arkison. It has more of the machine applique I love and slab blocks which Cheryl explains here, an intentional improv way of piecing. I enjoy participating in challenges whether a fabric or a theme challenge. I made Witco's Daisies in November of last year for the QuiltCon triangle challenge. It wasn't juried into the show, but still my favorite make from 2015. Barcelona was made for the MQG Michael Miller Glitz fabric challenge and I was excited to have it juried in to QuiltCon West this year. It was inspired by the artwork of Donna Mibus who recreated the panels flanking a Turner mirror from the late 1950's. The curved frame of Mies van der Rohe's Barcelona Chair (1929), still manufactured today, inspired the quilt title. If you are a new blogger or thinking about starting a blog, consider securing your domain name NOW. I found this blogging tip about domain name registration on the WestHost blog. (non-affiliate link) You never know where this blogging journey will lead and you may want your own website one day only to find YourBlogName.com is already taken. When entering a quilt in a quilt show, if you are like me and feel as though your free motion quilting skills are less than perfect, consider a 'busy' fabric for backing your quilt. With a patterned fabric, it's harder for the the judge to focus on things like quilting stops and starts or tension issues. If you could take a class or spend time with any quilter, who would it be? To this day, the most challenging thing I have done, both physically and mentally, was to hike the Grand Canyon with my uncle and three of his friends in December 2008. We covered over 50 miles in 5 days. Weather conditions were less than favorable, it rained a lot and snowed, even at Phantom Ranch. My favorite picture was taken of these cottonwood trees looking back toward at the South Rim on the way to Ribbon Falls hiking on the North Kaibab Trail. One day I would like to make a quilt with the this photo as inspiration. Enough about me, thank you for visiting and hope you will follow along on this quilting journey with me. Amanda at Gypsy Moon Quilt Co. This wouldn't be possible without the hard work (and a little hand holding of us newbie bloggers) of the bloghop hosts. I hear there are some wonderful prizes up for grabs, so please visit them for all the details and links to more new quilt bloggers this week. Note: Work has been going on behind the scenes the past two weeks to update the blog. I'd like to thank Valerie at Inkblog Design Studio for incorporating the vintage pearl button from my grandmama just as I had envisioned into the blog header design and other graphics. And thanks to Emily at Blogaholic Designs for the re-design, adding a gallery and more. Paige, I love the new elements on your blog like your header graphics and your signature. It was fun to hear the story and inspiration behind Quilted Blooms and to see those sweet little pearl buttons. Your gallery pages have a nice layout and it will be fun to watch those pages fill up with your beautiful creations. And hiking the Grand Canyon was a fun new fact to learn about you. You are an inspiration! Hey, this is Velda from GrannycanQuilt. Good morning. What a great post you wrote. I love the story behind the name of your blog. And, I love the tribute to your grandma. Mine both passed when I was very young. I wonder what I would have learned from them had I had an opportunity. If I had a chance To meet anyone Quilty, it would hands down be Jen Kingwell. Her designs sing to me. Enjoy your day. Nice to know more about you Paige ! Your Barcelona quilt looks really great. Paige, What a great post, loved getting to know you. Your quilts are AMAZING!! They are so unique and showcase your beautiful style. As for your question, There are so many quilters I would like to learn from, I am unable to just pick one. This is a great post. I loved reading about you and learning about how you got your blog name. I am excited to learn about the other new bloggers. Paige, it was great to learn the story behind your blog's name and just how much your grandmother influenced you. One thing I always love about your blog is your photographs of your quilts. They always show case your fabrics beautifully and are staged perfectly. They are just stunning. 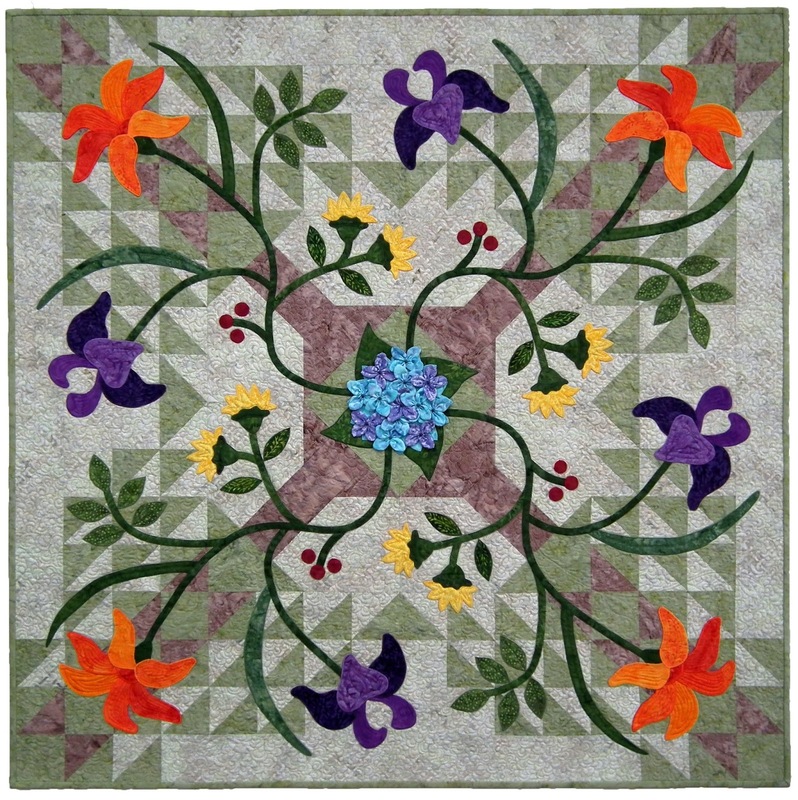 If I could spend the day with any one quilter I would probably choose Cindy Needham. She seems like she would be a hoot. Oh I can't stop drooling over those gorgeous Quilts they are look so amazing and how talented you are! The blog looks just fantastic too , I am really enjoying this blog hops, great opportunity to get to know more wonderful Quilters all over the world. If I could spend a day with any one Quilter it'll have to be Paul Hallinger of @evildemondevildog or Sariditty Handmade @sariditty. I found the story behind your interest in sewing and favorite quilt so incredibly moving, Paige. And I love that the flower pearl buttons are now incorporated into your blog, that is really a lovely touch. Spend time or take a class with any blogger? Honestly, I don't quite know how to answer that. I would love to spend time with ANY quilter at a sew in kind of setting. :) As far as classes go, there is so much to learn and I have had classes from wonderful people. Ahh, there. My brain finally woke up: I would love to take a class from Chawne Kimber and Carolyn Friedlander. 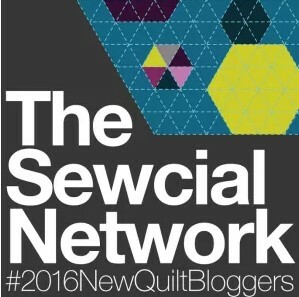 Thank you so much for helping us kick off the new quilt bloggers blog hop. I'm excited that it is underway! Paige, what a wonderful influence your Grandmother was in your life, from sewing to gardening. Your quilt tribute to her is beautiful. Your blog is full of pretty pictures and great information. I would love to take a free motion class from Christa Watson and hope it becomes a reality some day. HI Paige, I love your tribute to your grandmother. I learned my earliest stitches from my grandmother. I have a simple 2 drawer sewing cabinet that belonged to her and it's one of my favorite treasures. I love your daisy quilt above. I would love to spend time with Jen Kingwell. I love her use of fabric and all her patterns. Thank you so much for sharing the influence of your grandmother on your sewing and quilting life. Your quilts are lovely and inspiring and stories behind them make the so special. I'd like to take a class from Susan Carlson if I ever get a chance. I look forward reading more of your entries. (Smile) Hi! I've been blogging for nine years now, and it's nice to see new quilters entering our world. To answer your question, I'd like to take a class with Libs Elliott. That's because I've been quilting for so-o long (since 1976), that I've taken classes with all the traditional, seasoned quilters, and am ready to find out what the younger gals have to offer. Hope to see you at QuiltCon East, Paige! Excellent post! I learning more about you, I did not know you were born in Mississippi. You did a wonderful job story telling on where your name and blog theme came from. I am so lucky I live close to you! Your quilts are wonderful! I love the challenge you did and dedicated to your grandmother. If I could take a class with anyone right now I would have to say Marilyn Badger. Her quilting is just so stunning. Hi Paige! Isn't the blog hop exciting? I loved your story about your grandmother, and especially the quilt she inspired. It's wonderful! How nice for you that she has inspired your blog redesign with her buttons. Love it! Love all the quilts! and those buttons are just absolutely darling. Such an amazing keepsake from your grandma. How wonderful to read the story of how you learned to quilt and how you arrived at your name for your blog. I also really like the button added to your header. Congratulations on having a quilt juried into Quilt Con West. I'd love to spend time with lots of people Jaquie Gering is definitely on the list. Fantastic Paige! It is so lovely to learn how your blog name, graphics and quilt inspiration is linked back to your grandma. Your graphics really are wonderful, I may just have to look up your designer. I would really love to take a class taught by Heather Jones. And Cheryl Arkison, she is local-ish to me so that may very well happen. Thank you for such a lovely and thoughtful blog, Paige. I, too, have lots of lovely memories of my Grandmother, Mother and Great Aunties and their work with fibers. 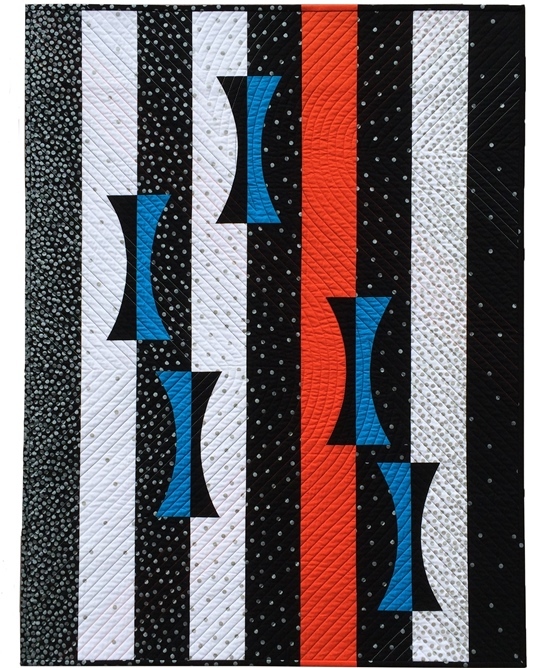 Free motion quilting is my big love lately and I am always looking for more designs, so I would love to see Leah Day or Angela Walters in action. Keep up the great work. You are an inspiration! Paige, I LOVE your new blog design. Those buttons and the story behind them are truly precious! Even down to the little social media buttons, they are so cute! I would say your blog is every bit as professional looking as some who have been doing this for years. Well done!! I would love to spend the day with Angela Walters! It's so funny how many of us have an experience with someone that led us to sewing and quilting. My mom taught me to sew when I was 8 and that was the beginning of it for me. I love that you have those vintage buttons and cards-I'm a sucker for vintage things. Hi, Paige! I really loved learning more about you and reading about how you chose your blog name. I love that your header and social media icons are based on the buttons from your grandmother. The blog updates look great! I don't know who I'd want to take a class from. I've never taken a class before, or been to a retreat, or even gone to a guild meeting. I wouldn't know what to expect. Quilting is very much a solitary activity for me. What a wonderful grandmother you had Paige. Your new blog header is simply perfect and a lovely way to remember her! Well I'll say you do enjoy a challenge! :) Your quilts are beautiful and I love how varied they are in style. There doesn't seem to be anything that you won't try. Including hiking the Grand Canyon - Wow! Paula Nadelstern has always been at the top of my list for who I'd love to learn from in person! What wonderful memories to have of your grandmother, and the quilt you made in memory of her is amazing! All of your other quilts are lovely too. Such a wonderful post, Paige. I really enjoyed your stories about your grandmother... your tribute to her in your Grandmama's Legacy of Flowers quilt is incredibly beautiful and heart warming - and the quilt is gorgeous! I love the buttons and how you incorporated them into your blog design and I REALLY want to see that cottonwood tree photo turned into a quilt. I know it would be stunning! Thank you for sharing your lovely quilts and their stories with us. Do me a favor and try to respond to this comment to see if I have fixed my non-reply comment problem. Thanks! OK...I think I fixed it this time in Blogger. Could you check one more time? This was such a fun post to read. I am so glad to have met you through quilting and blogging. Getting to know a little more about you through this post was fantastic! Love the new updates to your blog, Paige. I do love how your vintage buttons became your blog buttons. This was such a nice intro post, thanks for sharing this part of yourself. If I could spend time with one person in the quilt world.... I think it might be Sarah of Sarah Jane fabrics. I love her sense of color and style, and would enjoy talking with her about it. You have a wonderful blog set up! I really enjoyed reading about your adventures that make you who you are. Plus the photos of quilts is magnificent...you do amazing work as a quilter! I in all honesty would love to spend a day with Yvonne and get to know her better and see her quilting and hopefully get a lot of new inspiration (which I get from her on her blog all the time) but in person would just be so exciting and developing a deeper friendship would be great! Thank you for sharing have a fantastic creative day! Hi Paige! I love knowing that so many elements of your blog are inspired by your grandmother! Witco's Daisies is my favorite of the quilts you showcased--love those buttons covered with wood grain fabric, and the same fabric in the binding! I've never taken a class with a nationally known quilter. I think I'd pick Leah Day. I've taken one of her Craftsy classes on machine quilting, but I feel like that is my weakest part of the process, and I'd love to have her watch me and tell me what I'm doing wrong! Acuba is my most favorite plant! Id LOVe to see a photo of yours that came from your grand mother. As for the quilter...hands down...karen McTavish...ii absolutely love her...and have a deep respect for her as well. Hi Paige! This was an awesome post - I so enjoyed it. I was prepared for one thing when I read your 'About Me', saying you are a traditional quilter, but from your post photos you really are doing the modern thing now. Such great stuff. 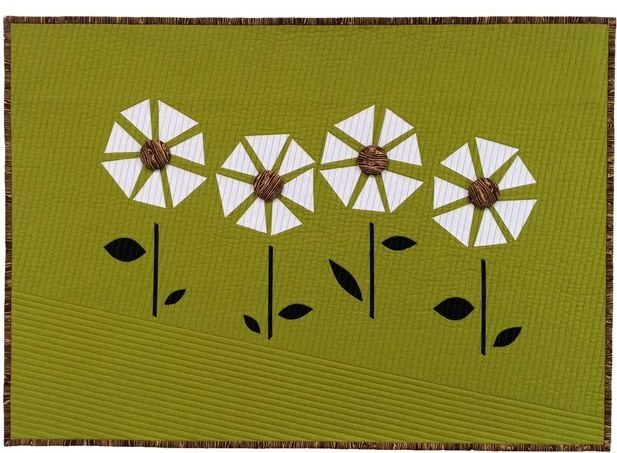 I really love your Up the Wall and Witco's Daisies quilts. So beautiful. I took my first workshop this week with Victoria Findlay Wolfe and I loved it - really opened up my eyes. I recommend her highly, and will be looking for more opportunities! Paige, what a wonderful post. I enjoyed reading along. From what you said you sound as if you really benefitted of the new quilt bloggers blog hop and re-vamped some of your blog look. I do not know how it looked before but it is sure lovely now. =) I am looking forward to reading more of your work. 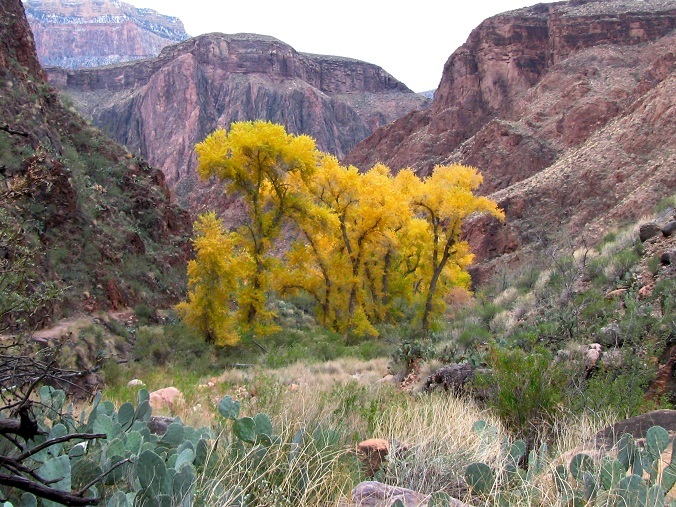 The photo of the tree in the Grand Canyon looks magnificent. Seven of theconcernedcraft.com here! Apologies for the delayed reply, I've been away. I really loved your post. Your range in style is truly admirable! I found myself loving every one. Grandmama's Legacy of Flowers is breathtaking, and the story behind it heartwarming. Thank you for sharing. If I could take a class or spend time with any quilter it would probably be... Chawne Kimber. Her use of the art of quilting to convey political and emotional messages is a constant inspiration to me. Paige, I enjoyed reading this post so much. What a great introduction to you. Grandmamas Legacy of Flowers is stunning. I think I love Witco's Daisys just as much, though. Beautiful picture of the Cottonwoods. I so enjoyed learning more about you and your quilting!! Your quilts are so spectacular and now I know a bit more about your inspiration!! Thank you! What a great blog! I'm so glad I am still making my way around to visit everyone's blogs because I would hate to have missed yours. Love your pearl button graphic and your blog design. I think we're a lot alike, I too consider myself a traditional quilter with an eye toward more modern design lately. So much here Paige! Sorry I missed this when you posted; June was all about Henry Glass and I curtailed blog reading to the barest minimum...anyhow I love how your grandmother influenced you so deeply and that you have transplanted blooms of hers in your SC home and vintage buttons. That Tree of Life quilt is just stunning and WHAT a perfect location in which to photograph it. I checked out the art of Donna Mibus, and have to say I prefer your colour choices, wink! That's an incredible photo of the Grand Canyon; one day I hope to see it. I've taken a class with Angela Walters and I would spend a day with her in a heartbeat; I've been to a trunk show and lecture by Paula Nadelstern and took a class in Edmonton from a protégée of hers, Deb Tilley. I'd dearly love to get back into kaleidoscopes but there are so many 'to-dos' that come ahead of them. I love your work, and am so impressed with your work-woman-ship, just such care, precision, and attention to detail.